Come to Fes to be enchanted by the historic medina. Staying in a traditional Riad is simply the best way to do that. 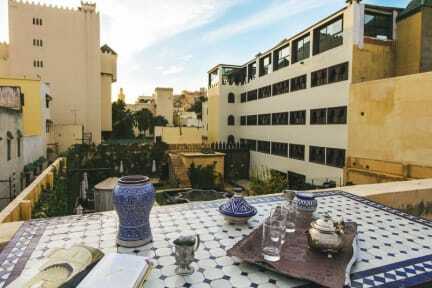 The location of the Riad is ideal, situated next to the famous hotel Palais Jamai and next to the gate of the Medina Bab el Guissa. It is easy to enter the medina or take a cab to ‘La Ville’ (the new centre.) The Riad is also nearby popular monuments including the Nejjarin Fondouk, Kairaouine Mosque and University of Al-Karaouine. Charming bazaars and souqs are found all over. We offer you a variety of comfortable intimate rooms with an authentic oriental character. It is also possible to rent the entire Riad.